The first time I tasted this recipe was back in the mid 2000s when a Nigerian couple who attended our Sunday school class brought this dish in for breakfast one Sunday morning. Everyone raved over it as it’s so creamy and delicious. 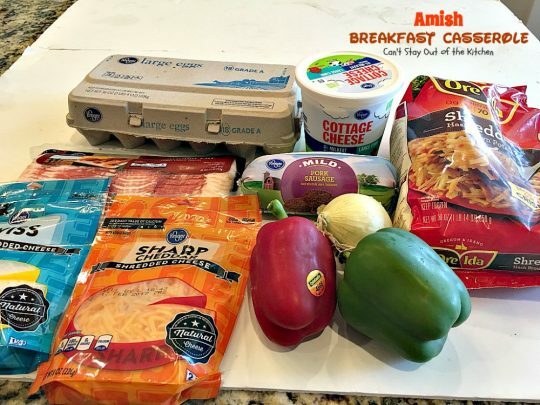 The nice thing about Amish Breakfast Casserole is you can either make it and refrigerate it over night (if that’s easier for you), or make up the ingredients just before baking. I’ve done it both ways and it turns out quite well either way. 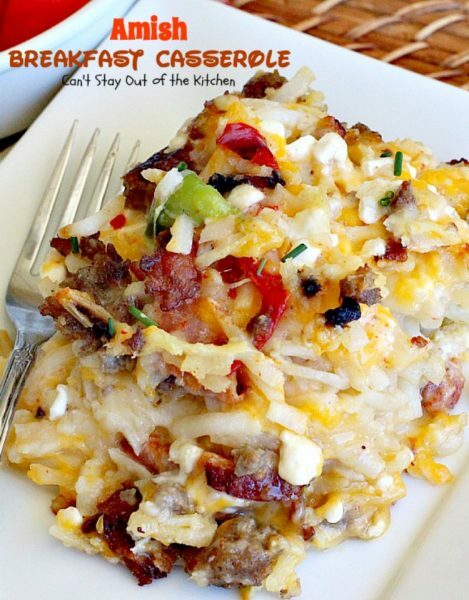 This recipe fills a 9×13″ baking dish so you can easily get about 10-12 servings–especially if you’re serving it with other food. Okay, I admit that I’m something of a Breakfast Casserole Queen. I love eating this stuff. I’ve made gluten free casseroles, sausage, Hawaiian, ham and cheese, bacon and spinach, sausage and gravy, sausage with potatoes & bisquick and with green chilies. Certainly I’m partial to breakfast casseroles. But I love the convenience of making these in advance and being able to present such a wonderful dish for holiday breakfasts. They’re also a great option if your family enjoys eating large country-style breakfasts on the weekends. They’re so hearty, satisfying and filling that you won’t be hungry for hours afterwards! 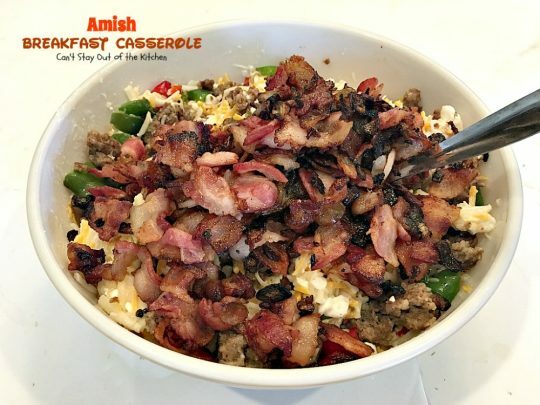 I made this recipe recently when we had a “Breakfast for Dinner” potluck at our church. 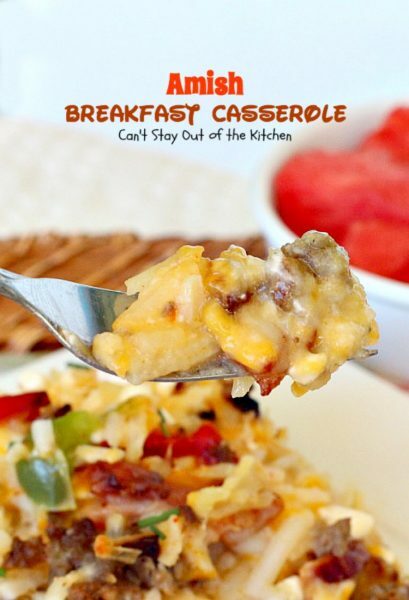 This casserole was gone within about 10 minutes and there were a lot of breakfast casseroles to choose from. 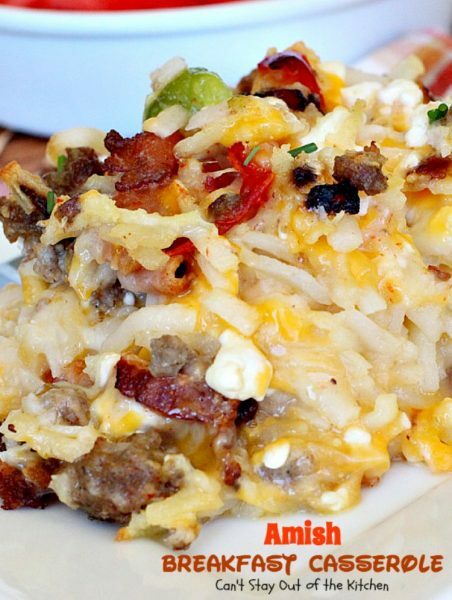 It is one of those delicious recipes that you can’t get enough of! 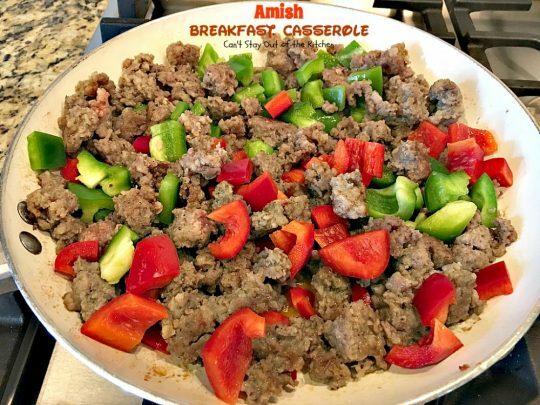 Amish Breakfast Casserole is a delightful breakfast entree you’re sure to love, especially if you enjoy protein-packed breakfasts. Amish Breakfast Casserole is a delightful breakfast entree – especially for holiday menus. 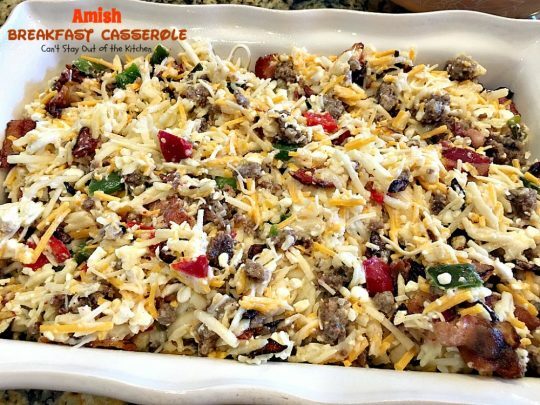 This casserole is filled with two meats and three cheeses! 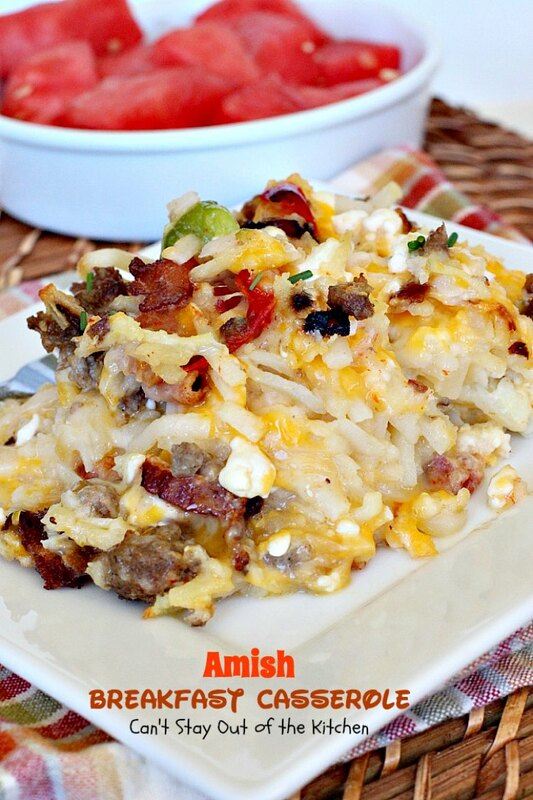 Amish Breakfast Casserole is super creamy with all that cheese. 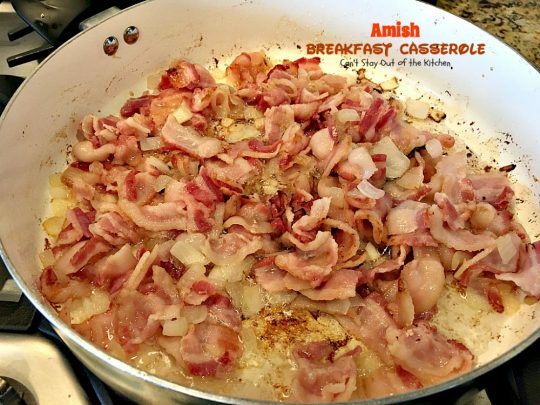 In a large skillet, cook onion and bacon until crisp. Drain and set aside. 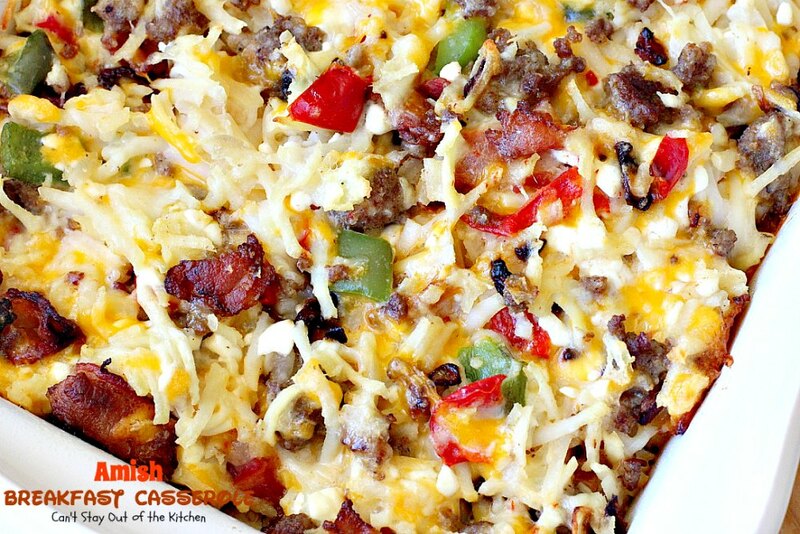 Meanwhile, in another skillet brown sausage. Add red and green bell peppers and saute until peppers are tender. Drain any grease. While meat is cooking place hashbrowns in a very large mixing bowl. Add cheeses. Beat eggs. Add to cheese and potatoes. Add sausage and bell peppers. Stir very well to combine. Pour ingredients into a greased 9×13″ glass baking dish. Bake uncovered at 350 for 35-40 minutes or until hot and bubbly. Garnish with fresh, snipped chives. 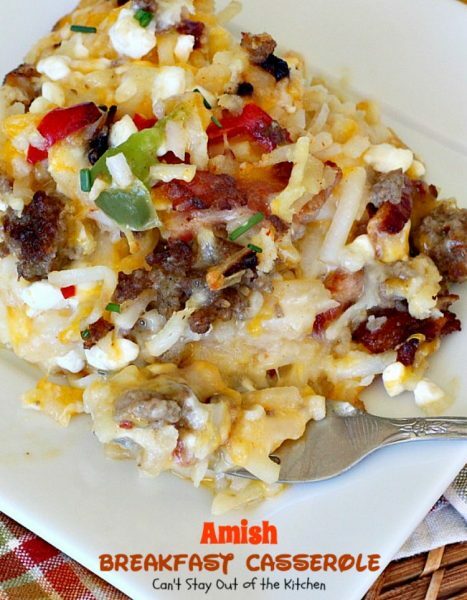 Amish Breakfast Casserole will serve 10-12 easily. Especially if you’re serving it with other food. 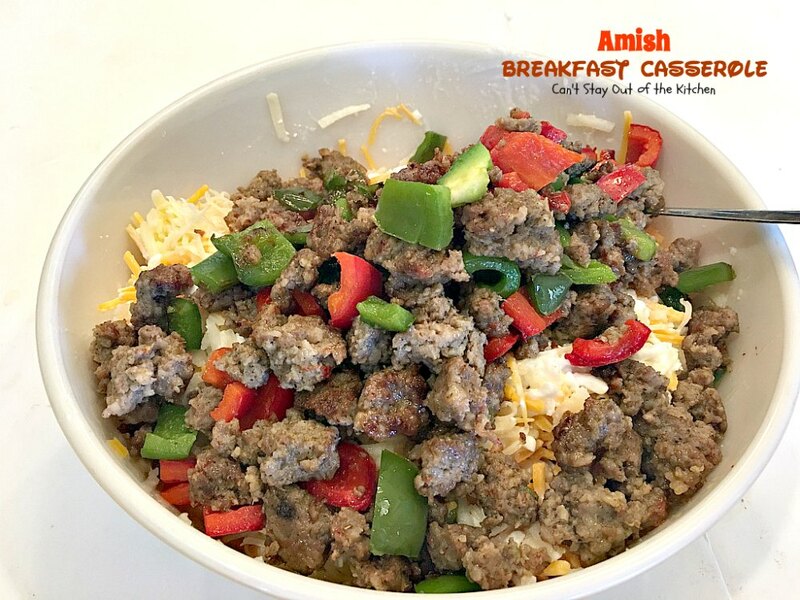 If you enjoy high protein breakfasts, this is a great place to start! This recipe is also gluten free. Every bite of Amish Breakfast Casserole is succulent and amazing. Amish Breakfast Casserole is a fantastic entree for holiday breakfasts! 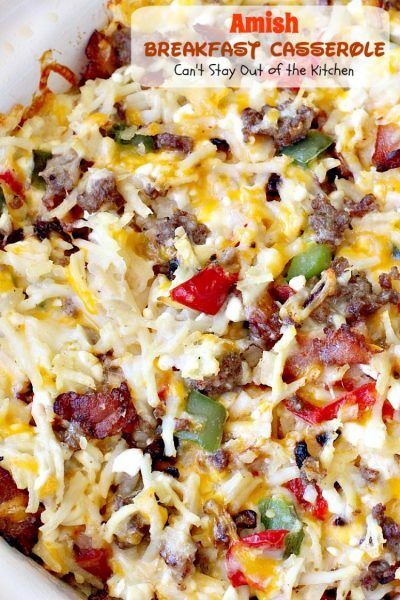 This one uses 2 meats, 3 cheeses, hashbrowns, eggs and bell peppers. Amazing. Gluten free. In a separate skillet cook sausage and bell peppers. In a very large mixing bowl, combine the remaining ingredients; stir in bacon mixture and sausage mixture. Bake, uncovered, at 350° for 35-40 minutes or until set and bubbly. NOTE: You can also make this ahead and refrigerate overnight before baking. 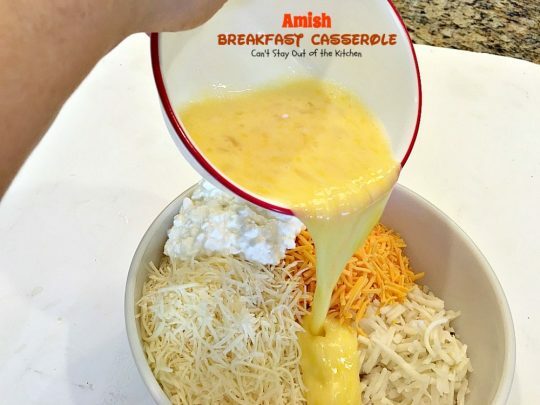 I brought this casserole to a “Breakfast For Dinner” potluck at our church. It was very well received! This recipe has plenty of flavor even though it’s not seasoned with salt or pepper or any other seasonings! Serve this casserole for the holidays and all your guests will want the recipe! 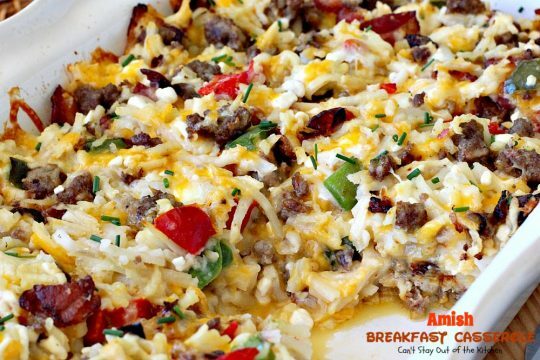 Can you use cubed hasbrowns instead of shredded? Hi, Kathy. I’m sure you can with equally good results. This was not the best casserole i’ve taken to pot lucks. But in it’s defense i did substitute ham chunks for the sausage and bacon, omitted the mushrooms, and seasoned with garluc powder and italian spices. Ummmm…maybe i should have tried following the recipe! Hi, Laurie. The casserole needs the bulk of those ingredients to taste well. Try the original spices too. They turn out perfectly. I didn’t see mushrooms in the recipe. Are you talking about another recipe. I don’t make this recipe with mushrooms. Perhaps she was referring to another recipe. Could you cook this in a crockpot overnight? Hi, Annette. I’ve never done it that way before but if you have a crockpot that cooks REALLY slowly, it might work. I probably would like to check it after 4-6 hours on low to see how it turns out. This was delicious. Made it exactly as written. Thank you! Hi, Nancy. So thrilled that you enjoyed the recipe. I think it’s perfect for holiday breakfasts too. I do low carb. 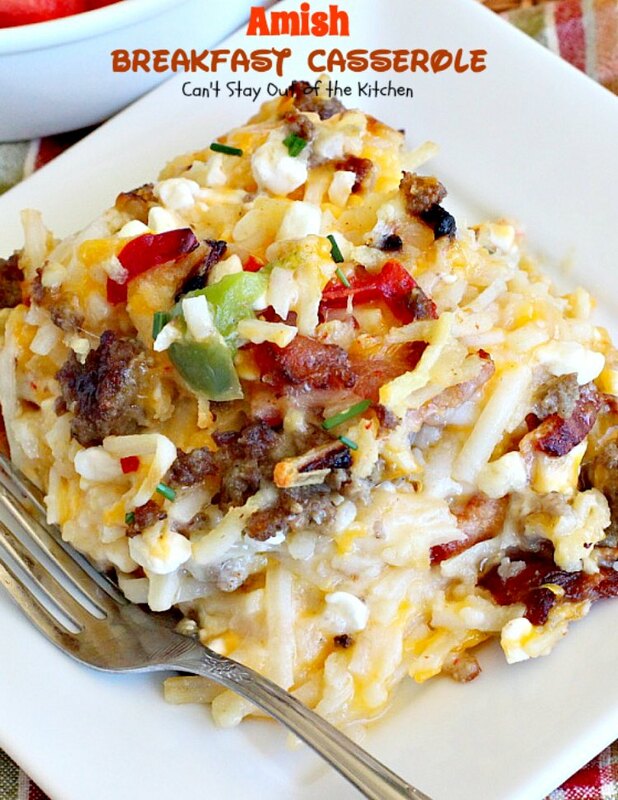 Any ideas what I could use instead of hash browns? Hi, Kelly. I’m not sure what would be a good option to replace the hash browns.Sorry. 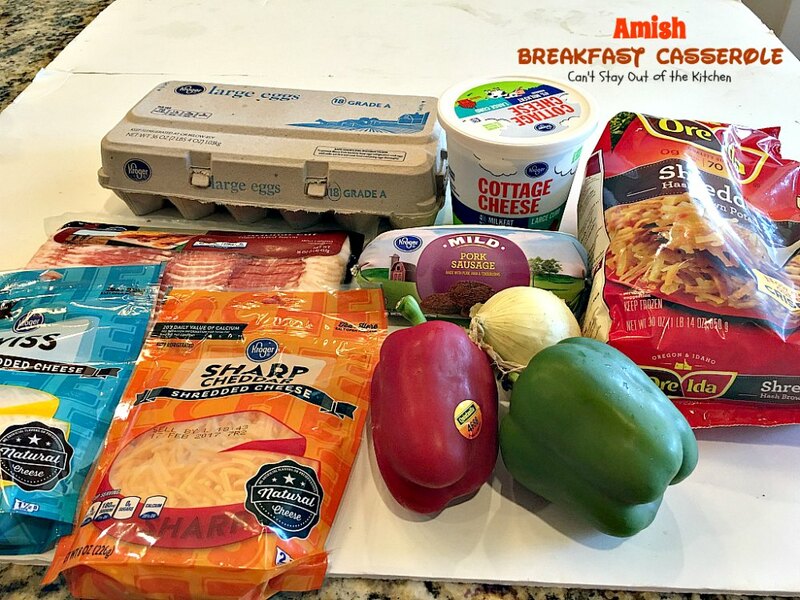 Made this for New Years morning… I had put cottage cheese in my cart at the store, but when I got home… alas, it didn’t come with me. So, I added an extra egg and used sour cream instead of cottage cheese. It was delicious! I think I would make it with sour cream from now on. Thanks for the tips, Danna. So glad you enjoyed the recipe! I’m not a fan cottage cheese. Could you substitute ricotta cheese instead? It would probably work okay. But the cottage cheese really turned out great, Kimberly. Both will work. Thanks for sharing. Looks luscious ,could you use ha in place of sausage. 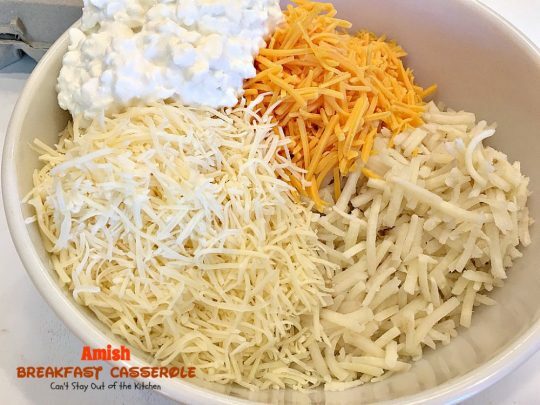 I’m sure ham would work in this casserole as well, Kristi. Why don’t you give it a try? Can this be made ahead of time and freeze till ready to cook? Hi April, You can refrigerate it 24 hours in advance, but I wouldn’t freeze it. Enjoy.